Rachel Notley will be a leader to Conservatives looking for a Premier who will create jobs, generate investment and diversify Alberta’s economy without destroying schools and hospitals. 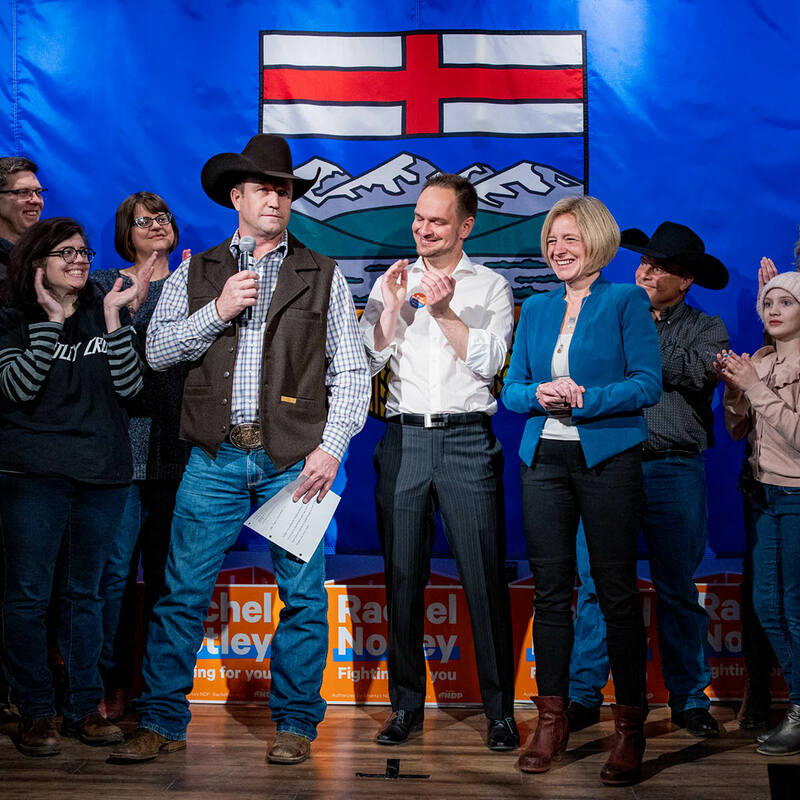 Notley made the promise in Calgary alongside Denny Hay, an Olympic gold medallist and Canadian Pro Rodeo Hall of Fame inductee and longtime PC voter. Hay is endorsing Notley and encouraging other Albertans to look at Notley’s plan. In recent weeks, more and more long-time Progressive Conservative voters have questioned Jason Kenney’s reckless plan to give a $4.5-billion tax giveaway to profitable corporations, or promised changes like his plan to hurt workers by cutting overtime pay for banked hours. Many are also deeply concerned about ongoing revelations about Kenney and the UCP. Extreme statements by UCP candidates continue to show troubling views about their fellow Albertans. And Kenney is still struggling to tell the truth. Notley is promising to balance the budget in the next mandate, while building pipelines and getting Alberta’s energy products moving by rail. In the wake of an oil price collapse that hit Albertans hard, Notley has also promised to significantly increase processing, upgrading and refining in Alberta. Her plan will secure $75 billion in private investment to create 70,000 jobs. She is also promising to maintain Alberta’s $11-billion tax advantage over every other province. While Notley has a plan to build Alberta’s economy, she won’t put funding at risk for kids in schools or patients in hospitals. She is also standing on a strong record of making Alberta a welcoming place, defending Albertans regardless of how they look, how they pray or who you love. While Kenney claims he holds the pen on a new party, he continues to bring together the worst of the Progressive Conservative and Wildrose legacies. Kenney’s plan for workers seems like a carrot for those at a very top and a stick for everyone else, says Notley. It's not a plan for prosperity for all hard-working Albertans. Kenney’s platform includes an admission that his cut to corporate taxes will do next to nothing for at least two years, while simultaneously freezing spending as the province grows. Economists have estimated Kenney’s plan actually represents a 14 per cent cut per person. He is also under fire for a promise to cut overtime pay for workers. Alberta needs a leader who will work for all Albertans, Notley says, not punish regular working people.